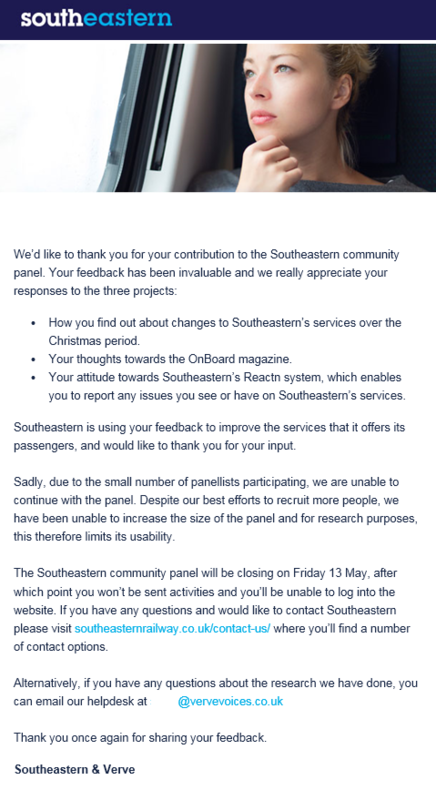 In an email to participants today Southeastern have announced that their “Community Panel” is being closed with immediate effect. We’re not surprised: we have already written about the lack of engagement by Southeastern in the Panel and how there has been only one comment this year on how good or bad their services are. But we’re disappointed that there has been no effort to develop a new, more engaging, successor. Instead participants have been told that they should simply contact the out-sourced ‘Customer Services’ department in the Midlands. In October 2015 Southeastern launched a Community Panel and invited customers to join it. It has been used to recruit testers for the Problem Reporting Application, but a principal part of the Panel was an online, members-only, discussion group. However Southeastern do not appear to have made the resource or cultural commitment to engage with members of the Panel and to draw them into a dialogue to improve their train service. So at the moment the Panel is not serving a useful purpose.